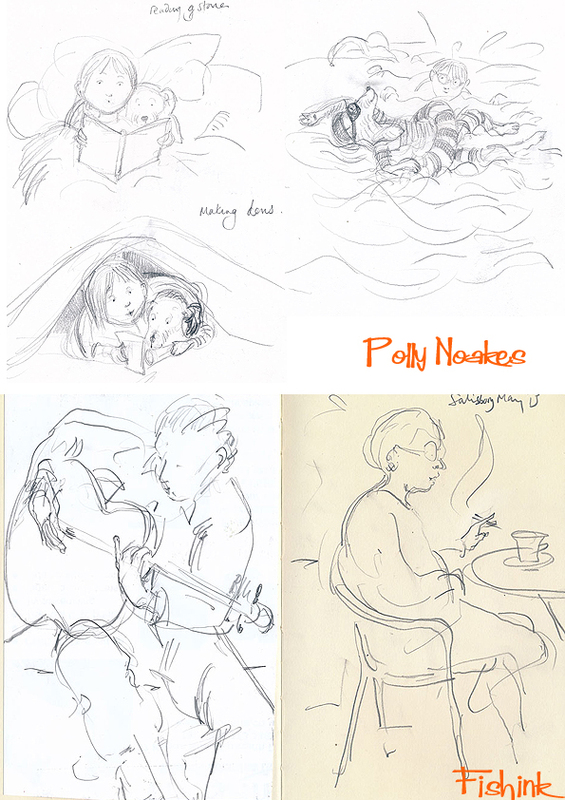 Polly Noakes tells me that illustrating and storytelling are central in her life and what really makes her happy. 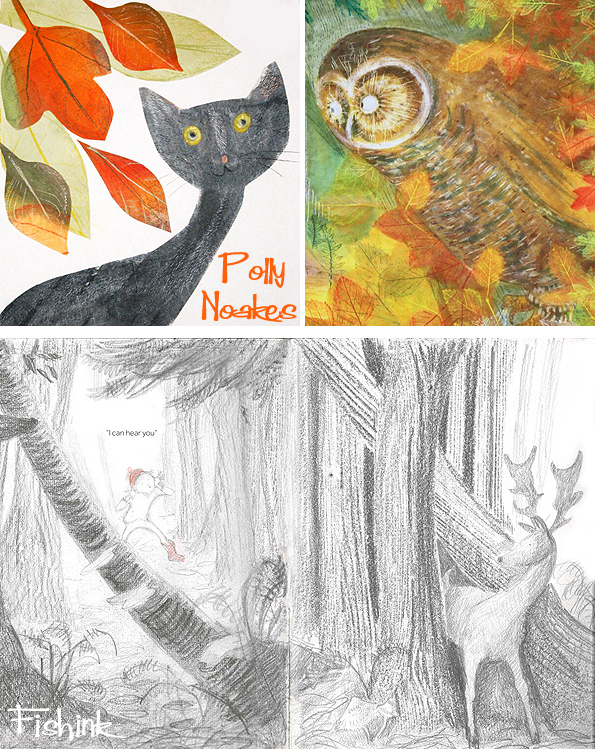 I’ve known Polly (online) for sometime now and was interested to hear more about how her illustrative journey was progressing. I fired a few excited questions in Polly’s direction. How did you first get interested in children’s illustration? At 14, I knew I wanted to be a illustrator and luckily my mother encouraged me, she was always buying Arthur Rackham and Charles Keeping books for my birthday. I studied on the HND Illustration course at Cambridge School of Art years ago and was tutored by Martin Salisbury and Warwick Hutton, both were to be huge influences on my career. 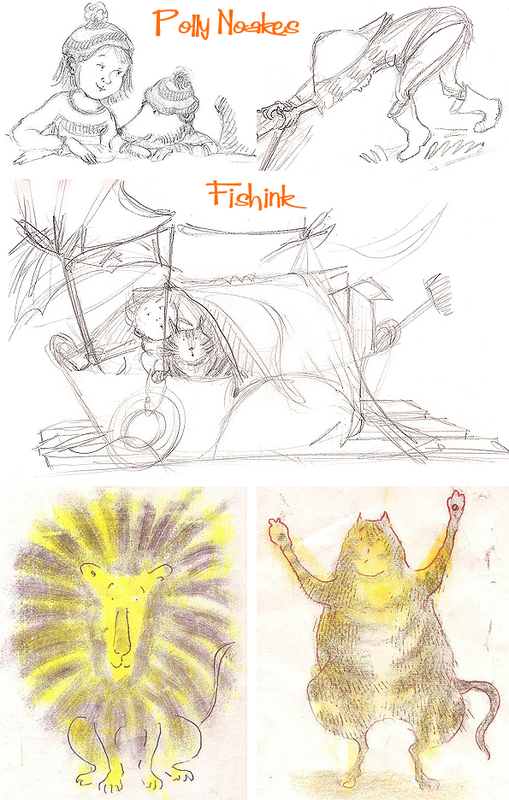 Children’s illustration wasn’t part of the course then, so when I graduated, my direction was uncertain. Warwick took me under his wing, I owe him so much as he encouraged me to illustrate fairy tales and I found my niche. From there, I started writing my own stories and in 1991 my first picture book was published with Orion. Through Martin Salisbury, whom I kept in touch with, I became represented by his, then agent, Linda Rogers who specialised in children’s books. She creates work and textures by hand, colouring with inks and crayons. She then collages with glue or digitally, incorporating a loose and fluid line to add movement and spontaneity. Her lion (below) has strains of the work of Roger Duvoisin, such a lovely style. What picture books have you recently seen that have inspired you and why ? 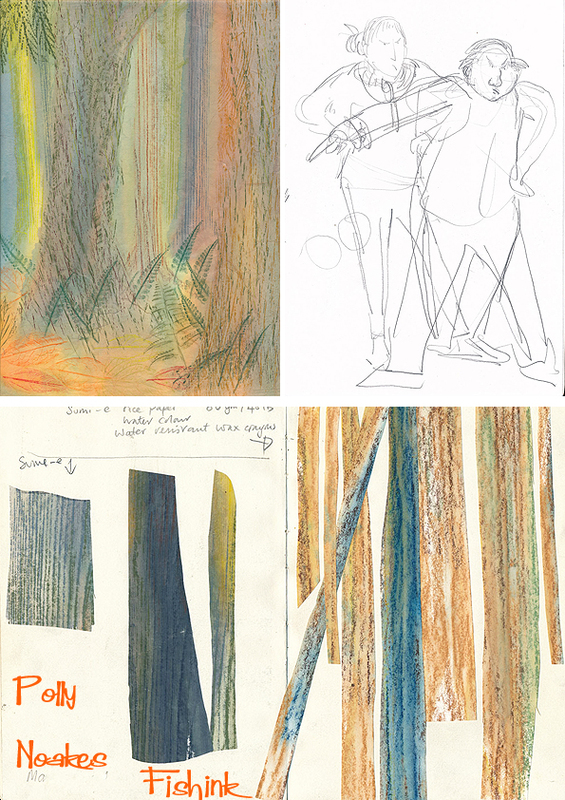 I tend to be attracted to books that display superb drawing skill, unusual composition, use of colour and light, for example the Selfish Giant by Alexis Deacon is a book I often refer to, he is a stunning draughtsman and his compositions are incredible. Alexis’s ability to convey so much in his line work is sheer magic. Lorenzo Mattotti’s illustrations for Hansel and Gretel are full of energy with a dynamic use of use of black and white that I’ve never seen before. 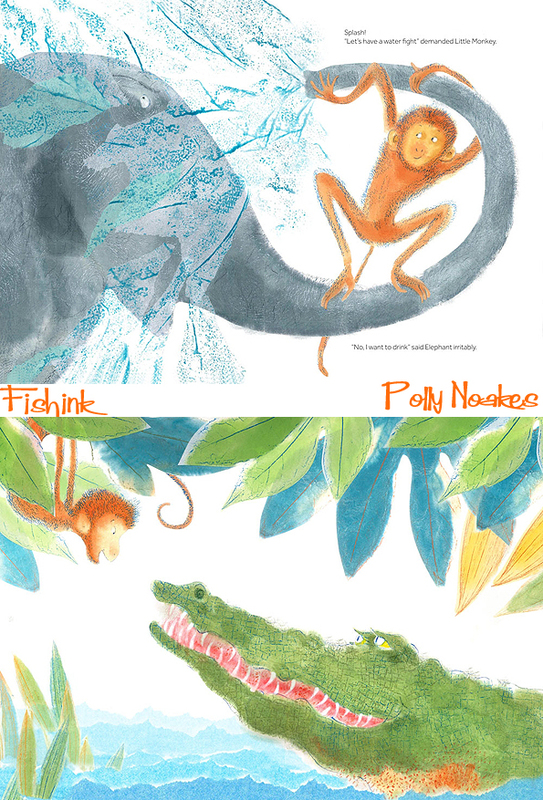 ‘A First Book of Nature’ illustrated by Mark Hearld, is another firm favourite. His skill at combining collage, print and drawing is amazing. ‘I Cinque Malfatti’ and ‘Le merveilleux dodu velu petit’ by Beatrice Alemagna are visual feasts. I adore her quirky sense of colour, texture and pattern… it’s so original. There are many more I could mention, some not published yet ! Who would you say are your favourite artists/ illustrators ? Brian Wildsmith has been a constant inspiration with exuberant colours and compositions, his work mesmerises me. Warwick Hutton for his use of colour and dramatic lighting which is simply remarkable. Helen Borten, (whom I discovered through your Fishink blog), always leaves me in awe. More contemporary illustrators – Komako Sakai with her unique use of media, creating depth to her images which are beautifully observed and tender. I admire MA graduate Melissa Castrillon’s work as it’s also so original and her use of colour and pattern is exquisite. 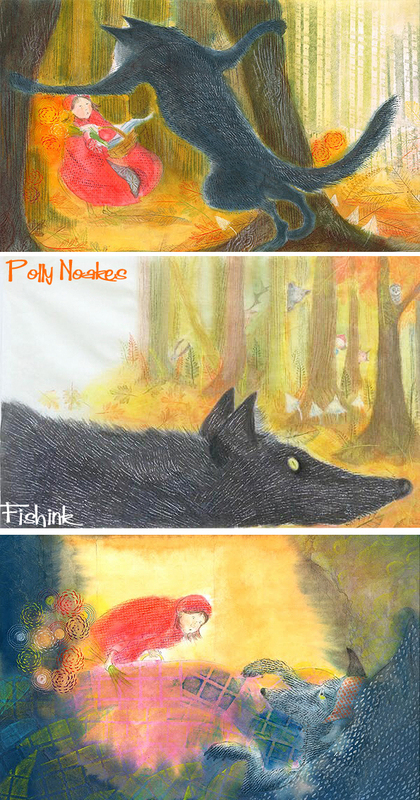 I love Polly’s rendition of this famous classic and particularly her textures, colouration, patterning and mark making. ” I work into an illustration with texture and pattern, all done by hand. I love the process of physically working on the rice paper and seeing the luminous colours build up slowly. Rice paper when wet is not the easiest medium to use but it seems to have chosen me and I am hooked! What I have learned these last few weeks is that instead of feeling the need to control the painting – let go and allow it to unfold. To relax and keep the fun and inspiration alive by pretending it’s a rough. 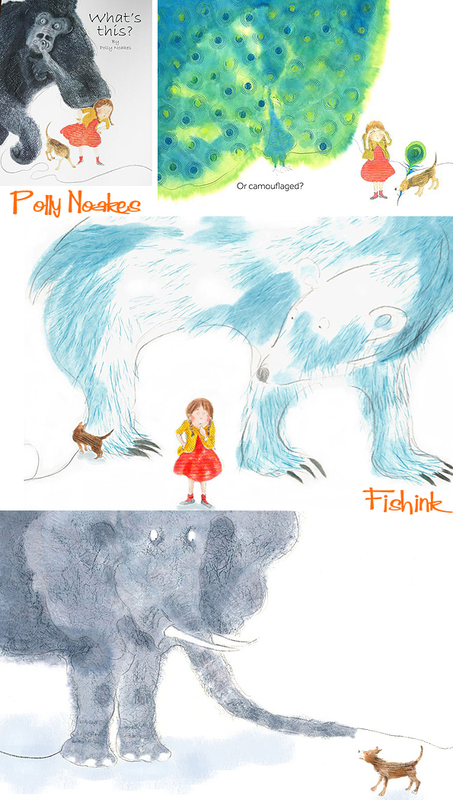 You recently graduated from the MA Children’s Illustration course at Cambridge. Can you tell us how you found the experience? It was fantastic, life changing I would say and great to be tutored by Martin again. I left illustration in 2001, disillusioned with the work I was doing and burnt out. I retrained in another career but missed being creative, so I arrived on the MA feeling very rusty but open to the challenges ahead. It was extremely hard work, fortunately the environment was supportive and my peer group brilliant. The tutors were amazing, their insights and comments were invaluable – I look back at it as an incredibly creative and intensive two and a half years that really fulfilled me. 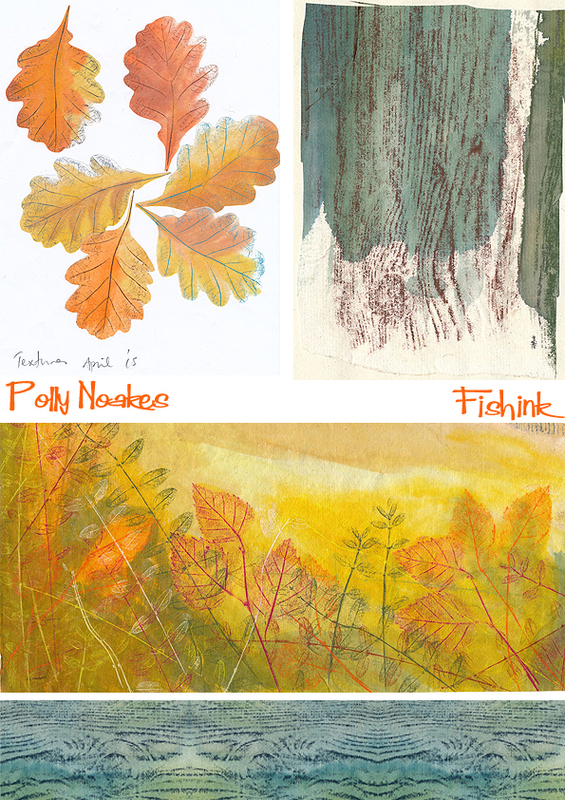 Some of Polly’s beautiful work with textures and layering here. How many people were on your course with you ? Did you study there everyday or meet for a couple of days a week ? How was the course structured ? I did the part-time course and attended every Wednesday in Cambridge with 26 students. The course is extremely well structured. In the first semester, its back to basics with observational drawing. Students receive a one-to-one tutorial every week and group crits twice a semester. Time with tutors is precious, so producing enough work for them is essential. Each module feeds the next, so learning about sequencing, pacing and structure followed. This fed the next module, creating an actual book/project with an intended outcome. We had one written assignment each semester supported by lectures, often given by top illustrators discussing their work. The course is more practical and creative than academic, although students do write a dissertation. What were the most memorable up’s and downs that you encountered ? Ok let’s start with the downs first ! Personally it was the sheer physical energy needed to produce the work (on top of a weekly long commute). It can be relentless, one basically eats, breaths and sleeps the MA. But that’s not really a downer, as I loved it. I remember the moment when I had to let go of all I had known in my previous career as an illustrator and felt totally de-constructed…it was unnerving. I didn’t know where my work was going, everything I did looked awful and I couldn’t see light at the end of tunnel. It was like jumping off the cliff edge and having to muster faith for a good landing ! For me, my landing was Pam Smy, our tutor flicking through my sketchbook and noticing scraps of textured, collaged paper. She nurtured this, whilst Martin encouraged me to incorporate my loose line work and somehow I found my ‘visual voice’. If anyone had told me I would be using texture, collage and pattern three years ago, I would have laughed ! Meeting my classmates has been incredibly positive and we all supported each other and continue to do so. Do you feel the course has led you onto a more directed pathway forward ? Most definitely, without the course I would have gone round in circles. It ignited my passion for illustration again and led to a totally new way of working. I would not have attained it without the MA, Martin and Pam. 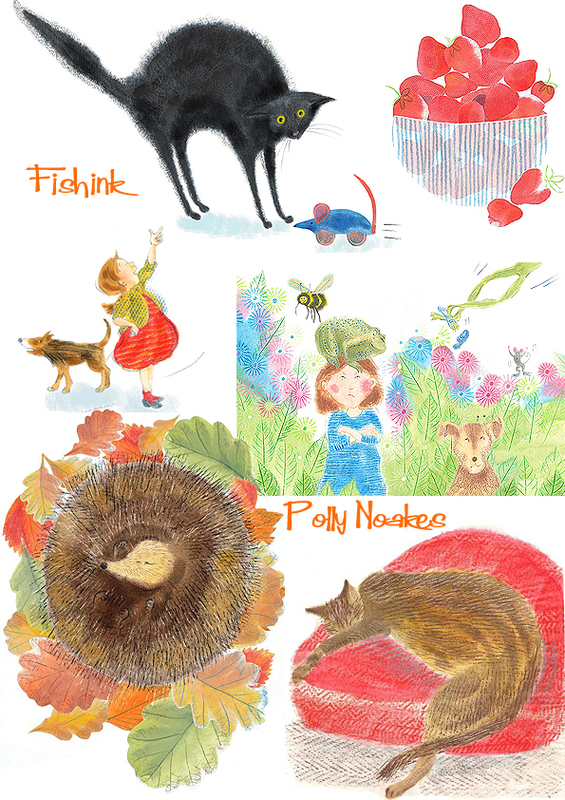 Look at these beautiful illustrations, the hedgehog is such a warm favourite for me. How much of the course is about illustration/ using materials/ writing/ the industry ? Drawing from observation is the basis of the course and used as a springboard for creating images whether real or imaginary. Any medium is encouraged to be embraced, which is great. Students have the use of fantastic print making facilities, which is a much respected tradition at CSA. There is an expectation students will be familiar with various techniques prior to the MA, so they are not taught, but tutors always help. The emphasis of the MA is illustration and visual storytelling, not writing. Publishers and agents visit regularly, giving talks about the industry which is extremely helpful. Plus there is a strong link between the course and the industry, which exposes students to important eyes ! Without attending the MA where do you think you would be now ? Not where I am now ! It’s a tough industry and the MA has facilitated my new work, catching the eye of agents, who approached me. On another level it lead me towards being fulfilled with my illustration again and I acquired a deeper understanding of my own needs as an illustrator. If you have any thoughts, pointers or useful tips for people considering a similar course to the one you have done, what advice would you offer them ? Be open and embrace change, criticism and most of all, experiment a lot. Let go of goals and any pre-conceived ideas about where your work is going and allow it to unfold, you might just be surprised ! What you put into it, you get back, so invest as much time physically, emotionally and creatively as you can. Don’t be scared, jump in and enjoy the experience and make the most of being a student. Mess up, get it wrong and don’t try and create perfection from the outset- that’s a creative killer ! So Polly, where next ? Recovering and getting a life ! 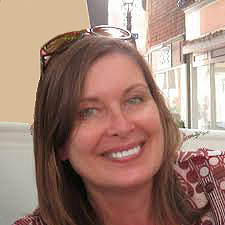 No seriously, I have a wonderful new UK agent, Elizabeth Roy Literary Agency who saw my work on the MA. We are working on a couple of projects and fine tuning them. I am also about to start on a small commission for the House of Illustration in London, which will be fun. Editorial illustration is an interest and a completely different pace to children’s book publishing, so I am building my editorial portfolio. 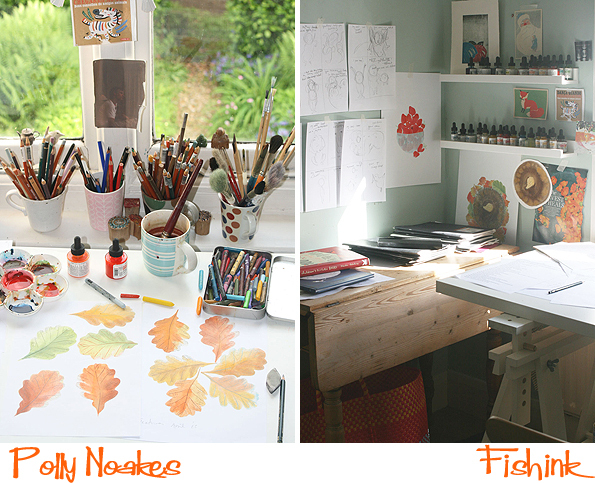 Occasionally I stop, relax and leave my studio, my favourite room…. and go out ! And what a beautiful room it is too ! Many, many thanks Polly for your honest insights and open thoughts on the MA Course at Anglia Ruskin University, Cambridge. I’m also a big fan of Martin Salisbury’s Books, so I imagine any course he’s involved with, would be pretty amazing. Thanks also for sharing your beautiful work with us here today and I look forward to seeing your picture books in a bookshop near me, very soon ! 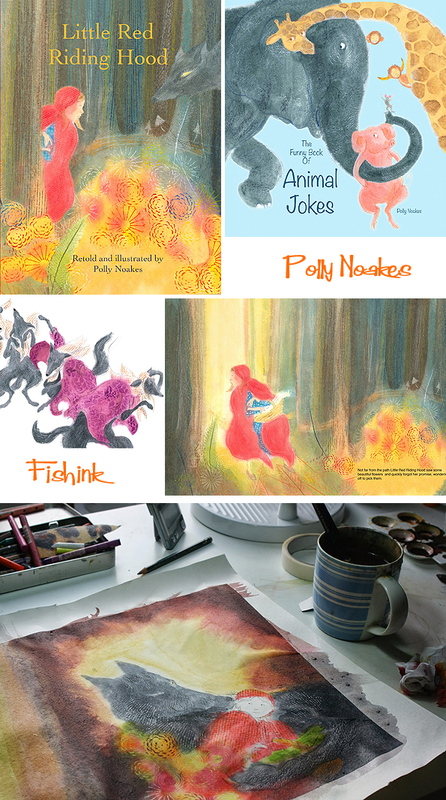 Thanks so much Polly – I’m an illustrator in Hong Kong and have for a fair few years been thinking of trying to come on that MA, and think I’m now in a similar boat to the one you were in before you started that MA. I did the BA at CSA many years ago. A good friend presently doing the MA at CSA (Jackie) sent me your article. Yes, I’d like to do this MA too, probably next year! Ack!!! I can’t come up with the adequate adjectives to describe this… pretty, lovely soft and vibrant colors, humorous, fun, whimsical, (love the cat asleep on the cushion), love the expressions, the mood. I was really bowled over by those two line drawings: the man playing the guitar and the woman sitting at the table having a cig. For some reason, it reminded me of Picasso. And I always like seeing photos of their working studio. Thanks Craig. Thanks Joy. 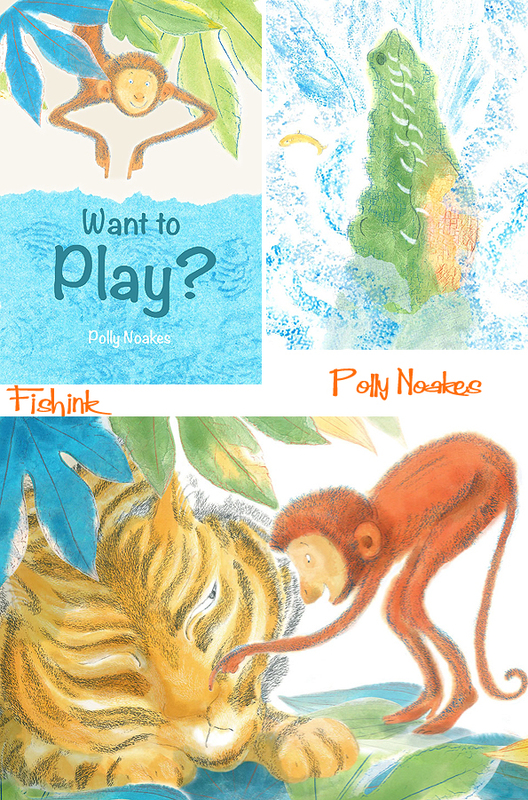 Polly has real sensitivity when it comes to line, colour and style. Her illustrations are soft on the eye and therefore greet the viewer with an amount of cushioning and safety (if that makes sense). I can see elements of Picasso in her line drawings too you’re right. “soft on the eye”. yes, you are correct. I never thought of it that way. Yes, her work is comforting, like a colorful, cozy blanket.